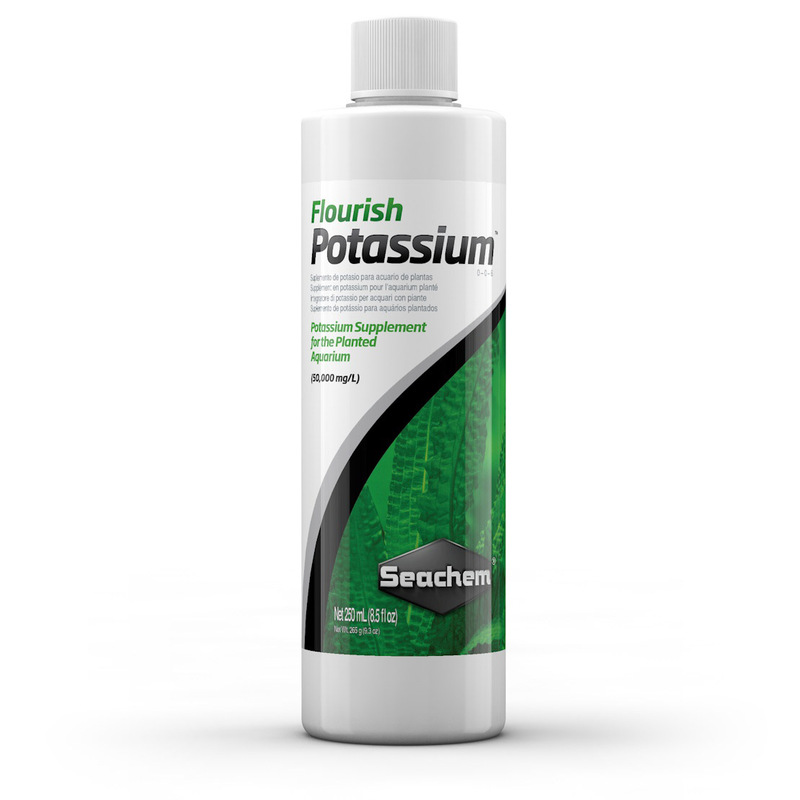 How much Flourish Potassium™ is equivalent to 1 teaspoon of potassium sulfate (K2SO4)? Does carbon in the filter remove Flourish Potassium™ from the aquarium water? Is Flourish Potassium™ safe for shrimp? I was wondering how do I know how much potassium to add, if I can add too much, or can I test for it. I use Equilibrium™ first then add potassium every other day. Any suggestions and is there a potassium test available? A: Potassium is a major nutrient and I've seen a wide range of recommended values all with good success between 30 - 120 ppm. Our Equilibrium™, if used at the recommended dose, will raise potassium to 50 ppm. The recommended dose of Flourish Potassium™ will increase potassium levels by 2 mg/L. As of now we do not manufacture a potassium test kit but there are some on the market that are available. The rate that you are dosing Flourish Potassium™ is definitely acceptable as this dosing regimen, along with using Equilibrium at water exchanges, should maintain potassium levels around 50 ppm depending on rate of consumption by your plants.